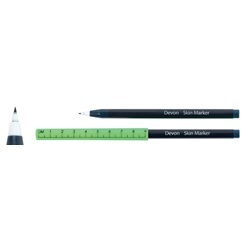 Fine tip marker tip with 9cm ruler cap without a clip. Markers are single-use and sterile, and contain medical-grade, non-toxic, non-smearing, and non-irritating gentian violet ink. Manufactured by Covidien. Comes 25 per box.